LAS CRUCES, N.M. — Virgin Galactic, which plans to offer suborbital space trips aboard the air-launched SpaceShipTwo, is looking into offering zero-gravity parabola flights aboard the carrier airplane, WhiteKnightTwo. 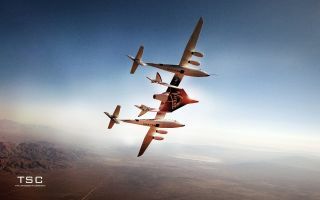 The twin-boomed, four-engine aircraft, designed and manufactured by Scaled Composites of Mojave, Calif., could carry a total of 14 passengers for zero-gravity flights — six in the right boom and eight in the left, said Virgin Galactic lead pilot David Mackay. The Federal Aviation Administration, however, may have other ideas. "Both (SpaceShipTwo and WhiteKnightTwo) were designed under a certain set of rules and regulations for space launch activities. To actually launch White Knight just purely for passenger training for zero-g experience or high-g experience, the thinking is that the FAA would probably want it to operate under a different set of rules and regulations. That might be difficult, but were still working on that," Mackay said at the International Symposium for Personal and Commercial Spaceflight in New Mexico. Mackay said if the FAA nixes White Knight's use as a parabola and high-gravity flier, the company would look at using other aircraft and devices, such as centrifuges, to prepare their customers for suborbital spaceflights. Zero Gravity Corp. currently provides parabolic flights in the United States. During the rapid descents, passengers experience about 1 minute of freefall, similar to the zero-gravity experience. "It's a wonderful feeling, but body control can be extremely difficult," Mackay said. Virgin Galactic plans to operate a fleet of five spaceships and two WhiteKnightTwo carrier jets at the newly built Spaceport America in New Mexico. The first commercial flight, with Virgin founder and chief executive Richard Branson and his family aboard, is expected in December 2013, said Christine Anderson, executive director of the New Mexico Spaceport Authority. The spaceship, also designed and built by Scaled Composites, currently is undergoing testing in Mojave, Calif. Its first powered flight is expected before the end of the year.